Funding a Project with an MPO from RPC on Vimeo. Inside an MPO from RPC on Vimeo. What’s a Metropolitan Planning Organization (MPO)? Established through federal legislation, MPOs exist throughout the U.S. in urbanized areas of more than 50,000 people. Comprised of representatives from local, state, and federal government agencies, they are responsible for developing and maintaining the long-range transportation planning process required to maintain their jurisdictions’ eligibility for federal funding for transportation improvements. Based on that planning process, transportation improvement projects are identified and prioritized for funding allocation. MPO Administration. 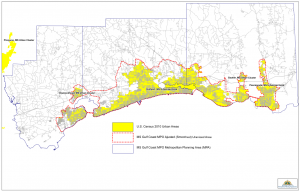 Gulf Regional Planning Commission (GRPC) was designated by the Governor of Mississippi as the MPO for the urbanized areas on the Gulf Coast in 1973. The GRPC manages the MPO planning staff, and has fiscal responsibility for administration of the transportation planning funds attributed to the MPO. GRPC staff coordinates plans and projects, implements strategies and ensures that MPO obligations are being met, but they do not govern the MPO. MPO Governance. Two committees meet quarterly to conduct MPO business. The MPO Transportation Policy Committee (TPC) assumes the responsibility of policy guidance and decision making, adopting policies, plans and practices by which the MPO transportation planning process is executed. In accordance with 23 CFR 450.306, the TPC includes “representation of local elected officials, officials of agencies that administer or operate major modes or systems of transportation and appropriate state officials”The TPC meets to discuss planning and programming issues as they affect regional transportation planning goals and objectives. The TPC is responsible for the adoption of a Unified Planning Work Program (UPWP) and the Transportation Improvement Program (TIP), and for establishing policies and procedural guidelines that comply with federal regulations. The TPC is guided by the recommendations presented by the Technical Coordinating Committee (TCC). The Technical Coordinating Committee (TCC) is comprised of jurisdictional representatives appointed by respective TPC members, as well as others representing various modes of transportation and/or transportation stakeholder groups. The TCC consists of individuals whose skills, training and professional status qualify them to take an active an active role in helping to shape and to oversee the transportation planning program for the region. The TCC includes numerous planning, engineering, and public works professionals with the training and experience to evaluate proposed projects and programs and to develop recommended courses of action to the TPC.